The first official online version of Homiletic has now been published under the leadership of Homiletic’s new editor John McClure. The journal is now an open access, juried, online journal. Homiletic is published bi-annually and includes articles and reviews on every aspect of preaching. The contents of Homiletic are fully indexed in Religion Index One: Periodicals, the Index to Book Reviews in Religion and the ATLA Religion Database (http://www.atla.com). 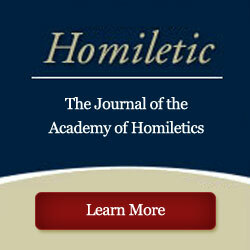 Click the Homiletic logo to the right to visit Homiletic online.